University of New Orleans Press, 9781608011087, 394pp. Much of the story of Hurricane Katrina lived on the internet as the city reconnected during its diaspora. When Cynthia Joyce went looking for one vital account for a course she was teaching, she found the site down and the piece forgotten. 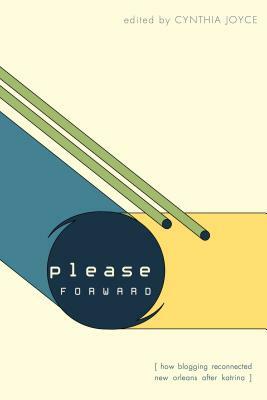 This inspired her search for the works that became Please Forward: How Blogging Reconnected New Orleans After Katrina. Some of the writing included is famous and easily obtainable; a good percentage of the work is currently unavailable due to aging servers and broken links. Taken together, these pieces are powerful testament to the New Orleans blogging community who proved the internet could function as a crucial platform in a time of crisis. Cynthia Joyce has been a writer, editor, and web producer for more than 15 years and has contributed to several regional and national publications, including The Washington Post, Newsday, NPR.org, Entertainment Weekly, and MSNBC.com, where she was a senior producer from 2007-2011; Nola.com, where she worked briefly as a producer post-Katrina; and Salon, where she was arts and entertainment editor from 1995-2000. She received her BA from Duke University in 1991, and her Masters of Science in Journalism from Northwestern University in 1993. She joined the Ole Miss faculty in 2011. She lives in Oxford, Mississippi. "This is an essential document of the state of mind of New Orleanians before and during and after Katrina. It's raw, it's pained, it's outraged, it's heartbroken- all the things it should be. "—Dave Eggers, author of Your Fathers, Where Are They? And the Prophets, Do They Live Forever?